With version 1.3.0 Jil now supports dynamic deserialization of JSON, with the appropriately named JSON.DeserializeDynamic(…) methods. DateTime formats must be configured through an Options object, and includes four popular JSON date formats. Jil returns a dynamic object, introduced in C# 4, rather than some custom “JSON” class. Using the parsed object is done with natural feeling C# instead of method or indexer calls. Jil also allows you to cast JSON arrays to IEnumerable<T>, JSON objects to IDictionary<string, T>, and either to plain IEnumerables. 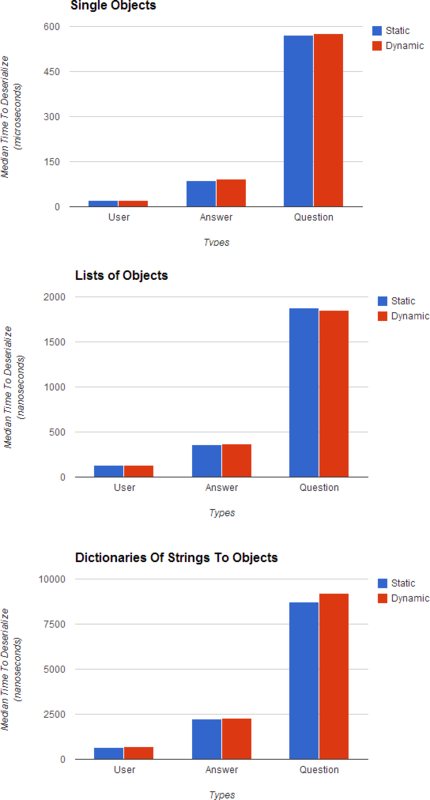 Dynamic objects returned by Jil are immutable. Setting properties, setting through an indexer, .Add, +=, and so on are not supported and will throw exceptions at runtime. As always, Jil works quite hard to be quite fast. While dynamic deserialization is necessarily somewhat slower than its static counterpart, it’s still quite fast. .NET’s built in number parsers are much more general purpose than what Jil needs, so a custom parser that only does what is demanded by the JSON spec is used instead. The JSON spec explicitly doesn’t specify the precision of numbers, and Jil exploits that to implement a non-IEEE794 floating point representation while parsing. Jil uses a less compact, but easier to parse, “Fast Number” of 169-bits for most purposes internally. Converting from this format to .NET’s built-in floating point values requires some extra work, but is still a net speed up for a small number of accesses. In addition, converting from integer “Fast Numbers” to .NET’s built-in integer types is quite fast. While dynamic dispatch implies a great many more allocations than with Jil’s static deserializer, the dynamic deserializer still strives to minimize them. You can see this in the methods for parsing strings, where a char is used if possible rather than allocating strings via a StringBuilder. Benchmarking dynamic code is tricky. Comparisons to other libraries may not be apples-to-apples if the same dynamic behavior hasn’t been implemented, or if parsing or conversion is delayed to different points. Rather than put together a, quite possibly misleading, comparison to other JSON libraries. The following compares Jil’s dynamic deserializer to its static deserializer. The code for this benchmark can be found on Github. While the dynamic deserializer is quite fast, it’s worth remember that dynamic dispatch is considerably slower than static dispatch and that some type conversions are deferred when deserializing dynamically. In practice this means that using the static deserializer is still noticeably faster than using the dynamic deserializer, but the dynamic deserializer is still usable for most purposes. After the inevitable bug fixes, I’ll probably be revisiting Jil’s existing SerializeDynamic() method to make it actually dynamic. Currently it only dynamically dispatches on the first type it sees, which isn’t nearly as useful. I like JIL more and more.. Wonderful job Kevin! any plan to support .net4.0?